XO1 COLLOMIX PROFESSIONAL HAND HELD POWER MIXER	Professional Hand-Held Power Mixer Includes Un..
Xo4 Collomix Professional Two-Gear Power MixerIncludes 1-WK140HF paddle.OR INCLUDES 1-KR140HF ..
Xo6 Collomix Heavy Duty 2 Gear Power Mixer	Includes 1-MK160 HF paddle. Collomix hand-held mixers ar..
XO55 HEAVY DUTY DOUBLE-PADDLE POWER MIXER	Xo55 Heavy Duty Double-Paddle Prof. Power Mixer ..
Collomix LevMix 65 mobile mixer	Mix and pour self-leveling compounds for perfect results	Save time ..
Collomix TMS2000 Heavy Duty Compact Mixer, 20 Gallon Speed, mobility and reliability are the main..
Collomix XM 2 650 Heavy Duty Forced-Action Mixer	When professionals want peak performance	XM 2 650 ..
Collomix AOX-S rotating bucket mixer AOX-S rotating bucket mixer with a high-speed cent..
Collomix RMX mixing stand	Support Arm for any Collomix Xo series mixer.The RMX mixing stand&..
Collomix Pair of Dual Mixing Paddles-Small or Large Batch For Mixer Xo 55 duo only -	~P..
Low Viscosity (Thin Materials) Paddle--Small Batch, LX120HF	· &n..
COLLOMIX Low Viscosity Paddle-Thin Materials DLX 152 HF	- ..
Universal 2 blade Paddle	· Powder-coated finish	· ..
Collomix Improved "Bird Cage" Paddle - Powder-coated finish	-&nbs..
COLLOMIX HEAVY DUTY 3-BLADE PADDLE MK 140HF · ..
Collomix, Heavy Duty 3-Blade Paddle-Large Batch MK160HF	· &..
Collomix Bucket Dolly for the 17 gallon bucket	- ..
1600W Electric Hand Mixer The mixer is an electrical power mixer, which fitted with double coun..
1600W Electric 2 Paddle Hand Held MixerThe mixer is an electrical power mixer, which fitted with dou.. The Mini-Mix 60 is a truly versatile mixing machine. 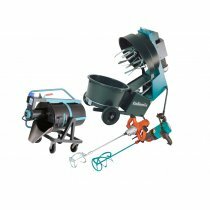 Quickly and thoroughly mix mortar, stucco, thi..
4CF 2hp 110v Portable Specialty Mixer, reverse and a lot more power!The Mortarman 120+ ..
Imer Vertical Shaft Mixer - Mortarman 360 (Mini Batch Plant)	Perfect for busy precast..
Imer Vertical Shaft Mixer - Mortarman 750 (Mini Batch Plant)	Perfect for busy precast mixing ..
Collomix 17 Gallon mixing bucket/tub	Heavy-Duty black polyethylene mixing tub. Job-site tough..
Collomix 17 Gallon TALL Bucket Collomix	Works with Collomix LevMix 65 mobile mixer	- &nbs..
ALLWAY HM1 1 GALLON PAINT MIXER ( OLD PM1 ) 1 Gal. “Helix” Paint Mixer, 1/card – HM1	Fastest ..
ALLWAY HM5 5 GALLON PAINT MIXER ( OLD TW5 & PM5 ) 5 Gal. “Helix” Paint Mixer, 1/card – HM..